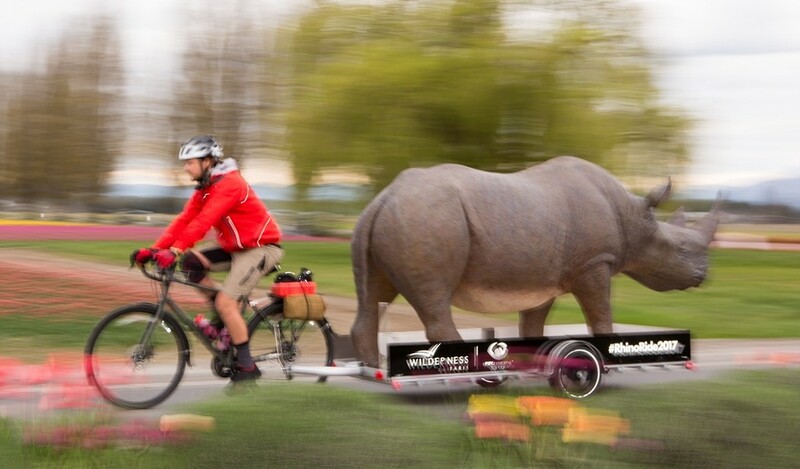 Matt Meyer is a South African conservationist, safari guide and cyclist who has spent the last few weeks riding his bike from the Canadian border on down to San Diego; all the while pulling a 300lb life-size black rhino sculpture.The pedal-powered spectacle known as Rhino Ride is raising funds for three South African organizations dedicated to protecting the Rhinos. Tomorrow, May 16, Meyer's trek arrives in the North Bay, on view at the Sebastopol Visitor's Center and crashing at Petaluma metal artist Kevin Clark's Reared in Steel studio for a party. The Crash of Rhinos event in Petaluma begins at 4pm and features Clark's own imaginative metal rhino sculpture and Meyer's realistic recreation on hand for viewing and pictures, along with music by the Highway Poets, a classroom Safari, raffle and food and drinks. The event also aims to raise awareness of what Reared in Steel does for Burning Man and get the community involved in creating large-scale interactive art. For more information about the Sebastopol event, click here. For details on the Crash of Rhinos in Petaluma, click here. For more information about the Rhino Ride event's fundraising efforts, watch the video below.